A pulled pork sandwich on a homemade roll is a favorite of the webmaster’s husband and a great alternative to outdoor BBQing. 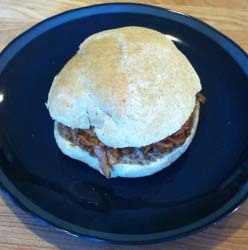 (Photo of BBQ’d Pulled Pork on a Homemade Bun courtesy of & © 2012 GH (Webmaster)/Sensory Nutrition/US12). Since around the country it is some stage of “back to school” time and folks are extra busy, we thought we would mention it as the pork is cooked in a slow cooker at the same time that the dough is rising for the rolls, all while you can be busy doing something else. I went to visit the webmaster last month and she met the car I was traveling in about 1 & 3/4 hrs from where she lives and I got into her car at a convenient rest stop transfer point. When we arrived at her house, the pork was conveniently getting done in the slow cooker. 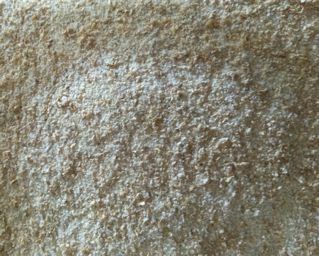 Since I offered to help her finish prepare the supper meal for her family, she put me to work grinding up some extra white whole wheat flour as she was running low on ground flour, but had plenty of nice, dry whole white wheat kernels in storage. In this blog post we’ll start with how she makes the homemade sandwich rolls. If you use a counter-top oven to bake the rolls off in, you don’t need to create a lot of heat indoors in Summertime if it is still warm where you are. If evenings cool down now for you, then you might not mind baking these rolls off in a regular oven. Preparing the sandwich rolls from scratch means YOU control what ingredients go into them. Since the webmaster is always busy with her family, she doesn’t have any time to to waste. She likes time spent in the kitchen to be satisfying and the results of her efforts to be well worth eating. By modifying a recipe she found on Allrecipes.com for honey whole wheat bread, she came up with her own approach to sandwich roll making that she says anyone with a stand kitchen mixer can do lickety-split! Equipment: Kitchenaid Stand Mixer; 5 qt mixing stainless steel mixing bowl; see-through glass measuring cup; measuring spoons and cups; a couple of clean lightweight linen kitchen towels; dough hook; a couple of baking sheets; kneading surface; silicone mixing and scraping spatula; oven safe mitts; calibrated food thermometer; tabletop or other baking oven (Tip: make sure before you do anything else that whatever baking sheets you plan to use will fit in your oven so check while oven is cool. A toaster size oven would need two small baking sheets sized to fit it, while a regular size home oven will only need one baking sheet sized to fit it). (Although the recipe will mention Active Dry Yeast, for even faster rising, look into Rapid Rise Yeast). Pour dry ingredients into large 5 qt. stand mixer mixing bowl, add wet ingredients, and mix thoroughly. Add a tad more flour if the dough is too wet. Allow dough to mix for a few extra minutes on a low speed setting to start the kneading process. Turn off and disconnect mixer, then remove mixer bowl from mixer, clean off dough hook and gather up the dough mass. Place dough onto floured surface and knead dough by hand the rest of the way until smooth. Place dough in oiled bowl (use a small amount of EVOO–usually just a couple of teaspoons full to coat the dough) and turn over to lightly cover completely in oil, cover bowl with kitchen towel, and allow dough to rise 30-40 min or until about double in size. Divide dough into 8 equal pieces and shape into round rolls. Place rolls on prepared baking sheets (prepared either by lightly oiling or even by spraying canola oil spray or else using baking parchment paper) allowing room for expansion, cover with kitchen towel, and allow to rise 1 hour. Remove cover & Bake at 350°F for 20 min. or until golden colored and done. The rolls don’t look as dark as traditional wheat rolls because they contain primarily white whole wheat flour. In order to grind the grain, the webmaster had me use a simple old-fashioned type hand grinder (that attaches to a table top or wooden butcher block island top via an adjustable clamp). She also has an electric grain grinder. 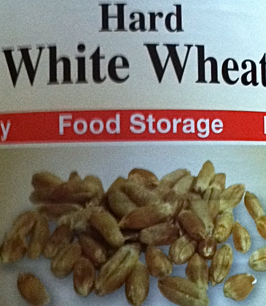 Whole intact wheat kernels will last longer in food storage than ground wheat flour will, so that is why she purchases the whole white wheat kernels in food storage size canisters (5.5# or 2.49 kg) that fit unopened on a pantry shelf. Once the container is opened, any unused kernels are put into freezer quality zip style plastic bags and then into a freezer quality plastic storage container and popped into the freezer for future use. They will have to come to room temperature in the future before being ground up. She grinds the flour as needed, but keeps at least a couple of cups plus always handy in case the mood strikes to whip up some rolls. There is a certain almost slightly “nutty” flavor to freshly ground grains, including from whole white wheat kernels. Any freshly ground flour is stored in an air tight container and kept out of sunlight, away from direct heat, and in a cool location. It is easy to place a freezer quality plastic storage container with freezer quality zip style air-free storage bags inside filled with ground-at-home whole grain flour into the freezer and just remove the container to scoop out the needed flour from a bag, close it up removing unwanted air and put the container back into the freezer. Whatever flour is scooped out should be allowed to reach room temperature before being used in the recipe. Similarly, any bulk yeast stored in the freezer should be taken out to measure what is needed, then be closed back up removing any unwanted air and the bulk container returned to freezer storage. Always allow the measured yeast to come to room temperature before trying to activate it. The mixer does the hard work to create the dough and a bit of hand kneading is all that is left to finish prepare the dough for its first rising. Once it is risen, it is a snap to punch it down, cut the dough into 8 equal size pieces, shape them, and place them on the baking sheets to rise a second time. FYI, the Fleischmann’s Yeast website has tutorial information on how to best let dough rise so that it easily doubles in size. Making the pulled pork is another matter and involves use in this instance of a countertop slow cooker. The pulled pork is pictured served on a homemade mostly whole grain wheat roll that was baked off in a tabletop toaster oven. We’ll share a recipe for pulled pork another day–it has all the flavor that one thinks of for a BBQ’d pork item, without stepping foot outdoors to mess up any grill. If you want a pulled pork recipe right away, you can grab one from here (tomatowellness.com) or here (eatright.org/kids) now if you wish. As a teaser, we sometimes like to add in some cooked assorted multi color sweet pepper strips and sweet onion strips on the sandwich roll to help in our meal building efforts. More details on that in an upcoming blog post. 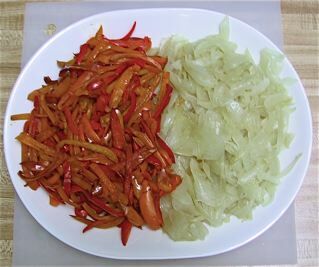 (Photo of cooked assorted multicolor sweet pepper strips and sweet onion strips courtesy of & © 2012 S B-H/Sensory Nutrition/US12). Do You Know How to Build a Better Grocery Shopping List?